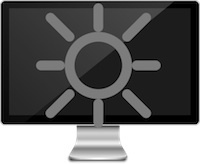 A little-known screen flashing feature exists in Mac OS X that provides an alternative way of being notified of system alerts, meaning that anytime you’d typically hear the general system sound effect feedback, see a bouncing Dock icon, or have a new icon badge appear, the screen will briefly flash instead. The screen flash is silent but offers unmistakable feedback that an alert has occurred, and can be used in conjunction with the standard alert sounds too. The screen flash isn’t overly dramatic but it is obvious, and it looks sort of like a transparent light grey flicker that flashes brightly over everything on screen for a few milliseconds. It’s really better observed directly than explained, and you can easily test out the screen flash before enabling it fulltime to see if you like it or not for your individual needs. Let’s dig in. Click the “Test screen flash” button to test it and see exactly what it looks like on your Mac. In some ways this is similar to the iPhone’s LED light alert feature that flashes with incoming phone calls and texts, except that it flashes for all alerts on the Mac, whether they’re coming from OS X or from apps. Anywhere that you’d typically hear the system beep, the flash will occur instead. Though this feature may be originally intended for those who are hard of hearing or otherwise have auditory difficulties, it’s also really useful for a wide variety of other scenarios. The most obvious is for those of us who like to work in silence, whether it’s nighttime, in a library, or just a quiet corner of an office. With the screen flash enabled you won’t miss out on any important alerts, but you can still keep a Mac muted so that the default audio alerts don’t bother you or others around you. 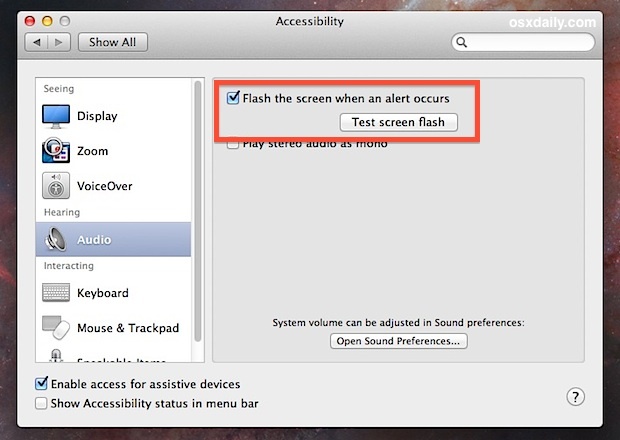 Also, if you have a multi-computer workstation with a handful of Macs, sometimes it can be challenging to quickly determine which Mac the alert sound came from, but with the screen flash enabled it becomes extremely obvious instantly which Mac sounded the alert by adding the additional visual cue. I started to use this function a week ago and it is good. Espacially when sound is from whatever reason muted or really low, it’s good function than.